Developer: ArtePiazza, Square Enix Co., Ltd.
"Dragon Warrior VII, known in Japan as Dragon Quest VII Eden no Senshitachi (ドラゴンクエストVII エデンの戦士たち, Doragon Kuesuto Sebun Eden no Senshi-tachi, lit. "Dragon Quest VII: Warriors of Eden") is a Japanese console role-playing game developed by Heartbeat and ArtePiazza, and published by Enix for the PlayStation in 2000. It was released in North America in 2001 under the title Dragon Warrior VII. Dragon Warrior VII is the seventh installment of the popular Dragon Quest series of role playing games, and is the successor to 1995's Dragon Quest VI for the Super Famicom. 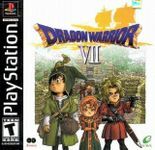 An immediate success upon release, Dragon Warrior VII's sales have totalled 4.06 million, making it the best-selling PlayStation game in Japan by April 6, 2001, and is a Square Enix Ultimate Hits title. It was the first main seriesDragon Quest title to be released outside of Japan since the release of Dragon Warrior IV in North America in 1992, and the last Dragon Quest title to be released in North America with the Dragon Warrior name. The game was produced by Yuji Horii, who has presided over the Dragon Quest series since its inception. Artwork and character designs were once again provided by Akira Toriyama, the artist responsible for all previous Dragon Quest games and famous mangaka. The game follows the Hero and his friends as they discover secrets about the mysterious islands surrounding their home of Estard. Through some ancient ruins, they are transported to the pasts of various islands and must defeat evil in each new location. Game mechanics are largely unchanged from previous games in the series, although an extensive Class system allows players to customize their characters." Source: Wikipedia, "Dragon_Warrior_VII," available under the CC-BY-SA License. Dragon Quest VII: Fragments of the Forgotten Past: A re-release of Dragon Quest VII, rebuilt for the 3DS hardware. New artwork, models, and better localization. A Lithograph system (which functions like the Grotto system of DQ9) was added. There is a secret dungeon and character, New weapons and armour. Several tweaks to monster stats, animations, and drops.